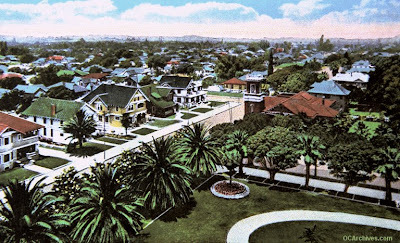 Until the cupola was removed from the top of the Orange County Courthouse (after the 1933 earthquake), it was common practice for newly married couples to go up to the top of the courthouse for a panoramic view of the surrounding countryside. The photo above shows a view from the cupola in about 1910, looking northeast, toward what is now the intersection of Civic Center Dr and Broadway. The movie posted above gives a 360-degree view from the top of the Old Courthouse, intercutting modern video with early views of the same locations. Most of the still images date from around 1910 to around 1923. Phil Brigandi shot the modern footage with my digital camera a few years ago. The fact that the old cupola was slightly higher accounts for the small change in perspective. The music is a 1914 recording of our state song, "I Love You California." A panel of speakers will discuss "Celebrating Our History & Our Heritage" at Mission San Juan Capistrano's soldiers' barracks on Monday (tomorrow), 7-8:30pm. This will be the first of a number of events in Capistrano celebrating National Preservation Month. Wow! Love that video, Chris. It's just too bad we don't see more structural landmarks still in place. Thanks for this! Hey that is where I got married. We did not get to go up to take a look! It's been difficult to access the top of the Courthouse since about 1933, so I'm not surprised if you missed that opportunity. Today it requires going through a locked (and somewhat hidden) door, climbing a narrow flight of stairs, winding your way through the attic, then going through another door. After that, you climb a disurbingly cockeyed and flimsy-looking flight of stairs that extends out over a skylight. (This is where I handed the camera to the Phil - who weighs much less than I do - and said, "I'll stay here. Take some pictures for me if you want.") At the top of these stairs is a trap-door which takes you up to the site of the old cupola. The trap-door only opens when the weather is warm and dry. Now you can view the Courthouse from the comfort of your house. By clicking on this link you can view a 3D model of the Santa Ana Courthouse thanks to Google Earth! The model was made by me from photographs. Please go take a look at it and let me know what you think. You can view a picture of my model at my blogspot. I would like to make more 3D models of historical buildings in Orange County so that i can post on Google Earth for the whole world to see in 3D. If you know where I can get good photographs or floor plans of buildings please let me know.